Felisa and Jeremiah are high school sweethearts from Cleveland, where they met one day after school, and have been attached at the hip ever since. While Felisa was taking a midday nap she was awakened by Jeremiah popping the question, where he asked, “Will you help me make the easiest decision of my life?” After looking into local weddings they realized costs were way too high. Since they had always wanted to travel, they began considering a destination wedding. At first, the couple was skeptical of hosting a destination wedding, because they were nervous about their families. Both sides proved to be supportive to host a celebration afterward that for those who couldn’t make it. The couple said, “We started to love the idea more and more.” They researched countries and destinations first, from Hawaii to Mexico. With Destify, and their agent Briana, they chose the Hard Rock Resort in Punta Cana, Dominican Republic. The resort had everything they could have ever wanted, from casinos to a nightclub. The resort turned out to be the perfect choice for a multitude of reasons. The wedding department proved to be very responsive, answering questions quickly, and making all of the decorative decisions an simple process. The couple also loved how easy it was coordinating group travel with Briana, as the wedding also turned out to be the couples’ first trip out of the country. They chose the complimentary package because it already had everything they needed for a small and intimate wedding on the beach, plus they added some fun additions. The night before the wedding the couple hosted a welcome dinner at the resort’s Japanese restaurant, where everyone kicked off their vacations at a hibachi table. On the day of the wedding, they spent the afternoon relaxing and getting ready for the sunset ceremony on the beach. Felisa and Jeremiah paid for a fun upgrade, where Felisa entered the ceremony by rolling up to the aisle in a vintage car. Afterward, the couple took photos and met their guests at a cocktail hour at one of the resort’s gazebos. For a spontaneous reception, everyone met at the resort’s nightclub and partied the night away. As part of the package, ceremony decor was included in the costs. The couple agreed what Hard Rock offered was perfect and said, “From our original $20,000 quote for a wedding in Cleveland to choosing this, it was a no-brainer.” The wedding served a purpose beyond the ceremony for each of the 8 guests. Felisa’s mom got to have a girl’s trip with her best friends and another couple got to have the honeymoon they weren’t able to have after their own wedding. Felisa’s advice is to make sure you choose the resort that’s the right fit for you. You spend the most time with the person you’re getting married too, so consider the best place you can enjoy each other’s company. 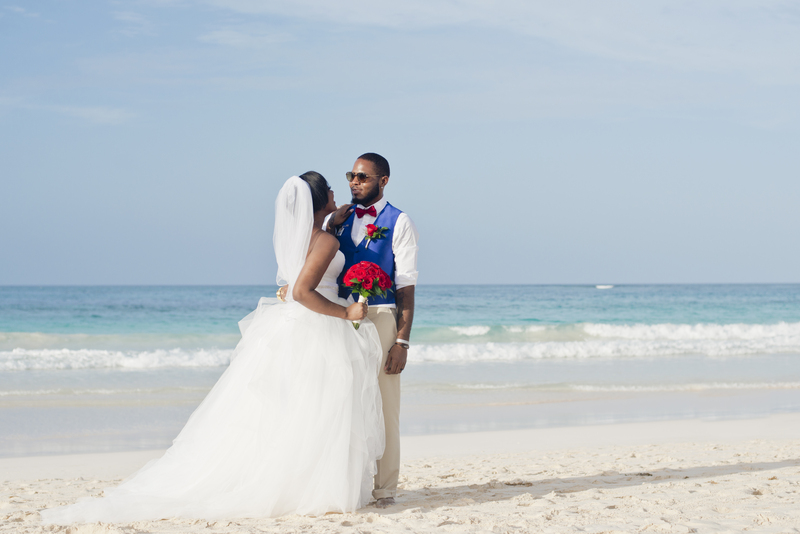 They loved the weather and setting of Punta Cana and recommend it to future couples. Choose a place you can spend time together and have an adventure!